Where I call home, panfish get targeted the most in spring and in the winter through the ice. 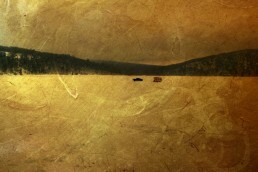 During these seasons, you don’t need a boat to be successful. In winter, you can walk or drive out to the community hot spot and catch fish from the school. 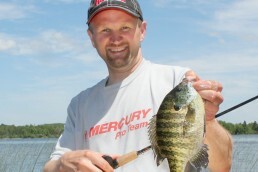 In the spring, find any harbor, marina, cove or shallow-water bay and you’ll have access to plenty of panfish. The majority of these follow the minnows in. And then, when conditions are right, they spawn in the shallows. Outside these times, the crappies and bluegills get the opportunity to grow as most anglers have difficulty locating both size and numbers of fish. Even though many of the good-sized fish get harvested in spring, not all fish use the main shallow bays or coves. Some will use hard-bottomed areas out in a main lake like reed beds. Anglers will miss these fish because the fishes’ movements tend to come later due to the colder water temperatures there than in the bays. But by the time midsummer comes, both the early (shallows) and main-lake fish have finished the spawn and are now focused on feeding. Also, the vegetation within the lake is usually in full effect along with the warming water temperatures. This pushes most of the mature panfish out into deeper water. Good weed edges of cabbage or coontail will hold good numbers of panfish. And as summer wanes on some of these, fish will slide deeper in the water column and even be found in 20-plus feet of water. Traditional tactics with the use of a slip bobber could work in this situation, but you might want to opt for a drop-shot setup with a leech or part of a ’crawler. Crappies tend to suspend, and early on they are found in and around tall vegetation. They can be caught using slip bobbers and minnows while targeting outside the weed edge part of the way down the water column. By using the countdown method, you can also be successful casting small presentations and slowly swimming them back to the boat. Once the lure hits the water, count various seconds before you start reeling to find the best target depth. A 1/32-ounce jig head with a Trigger-X Boot tail minnow or a Mimic Minnow body will work when fish are still feeding near the vegetation. Later into summer, a 1/16-ounce jig head will be needed to get the extra depth necessary to reach them. The best feeding times for crappies will be in low-light conditions. So, early morning can be good until the sun gets high in the sky and forces them deeper in the water column. Overcast conditions and rain will also help extend the bite and provide some action throughout the day. 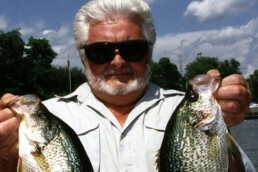 Evenings are perhaps some of the most productive times for summer-crappie anglers. Often, there will be a window right around sundown when they’ll flip a switch and bite like crazy. Being there for that right moment is indeed special, and will not be soon forgotten. Sunfish and bluegills will stay closer to the weed edges and weeds for protection from predatory fish. Finding them may take some time, but once you are close to them it won’t take long to catch one. When they’re schooled up they seem to be willing to bite all day long. There are certain times of the day that seem to be more productive for the truly giant ones, but you can usually catch adult bluegills all day. Good target depths are 8 to 20 feet along any main-lake weedline. Of course, any inside turn or point in the weedline will be a potential hot spot, so these are worth a look. There’s just something about watching your bobber go under that is pretty magical. For summer bluegills, a slip-bobber setup is the go-to method. Using a plain hook and a small hook is downright deadly. But when you’re really catching them sometimes the number 10 or 8 size hook can be annoying, as they seem to engulf the leech so quickly; here, every fish has to have “surgery” in order to get the hook out. Using a longer shank hook will help this or, better yet, use an ice-fishing lure such as a VMC Waxy Jig or Tear Drop Jig or Northland Doodle Bug. When you attach a leech it will not negatively affect the bite. What is does do is help both you and the fish. This jig will seldom make it down into the fish’s stomach, so it’s easier for you to take off, plus it will not kill the fish. The bigger-looking presentation is a slight deterrent for non-keeper-sized fish as well. Summer is in full swing, so don’t give up on the panfish. Simply adjust your location and techniques to deeper water and you’ll help everyone catch plenty this summer. Steve Mattson has been writing articles for MidWest Outdoors since 2001. He is a driven angler, guide and sponsored tournament pro who has won both bass and panfish tournaments, and has placed in walleye and pike events. He resides in northern Minnesota and enjoys helping others catch more fish. 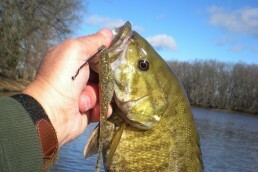 For more info: mattsonangling.com and @mattsonangling.